recipient: Mayor Francesco Zaccaria, Fasano and President Michele Emiliano, Puglia, Italy. Fasano is a town located in Puglia, Italy, a region that is fast becoming a popular destination for the rich and famous. While Fasano hosted Jessica Biel and Justin Timberlake’s wedding and is frequented by the likes of Helen Mirren, Meryl Streep and Mickey Rourke, this town holds a dark secret. In 2016, candidate Francesco Zaccaria, made a promise to the homeless animals and the community of Fasano, to build a new animal shelter. He is now “Mayor” Francesco Zaccaria, and not only has he failed to keep his promise, he has been holding 150 innocent dogs hostage for 18 months, in a substandard shelter that offers no protection from the scorching heat or the freezing winter temperatures. After Mayor Zaccaria took office, his Health Department declared that the shelter was not up to code. He then confiscated the volunteers’ food storage container and sequestered the shelter so that the 150 dogs could not leave and no new animals could be accepted in. Even though money is available for a new shelter, the Mayor continues to force these poor dogs to live without proper shelter and robbing them of a chance at a new home. These 150 dog hostages and the abandoned animals of Fasano need your help! Please join Animal House International and I to insist that the Mayor fulfill his campaign promise to build a new animal shelter immediately. When you sign the petition, an email will be sent to the mayor and regional president, so please also include a polite personal comment. Thanks as always for being the voice for the voiceless and thank you Rebecca Rodriguez of Animal House International for their video footage. Lift the sequester on the Fasano shelter and give the animals currently living there a chance at finding a new life outside of this prison. Replace the container to safely store food and medicines necessary for the care of the animals. Keep your campaign promise to build a new shelter. Develop an adequate plan to care for the homeless animals in your region while the new shelter is being built. You have a chance to be a hero or to contribute to suffering. Your legacy is your choice. Thank you! You made it happen. Sadly, 3 of the dogs did not live to see this day. *The sequester has been lifted. The dogs can be adopted. *Construction of vet clinic has begun. *Dialog to build new shelter has commenced. Quattrozampe Nel Cuore Fasano, the NGO that cares for the shelter animals, is raising money to get the 147 dogs vet care & into forever homes. For more details, click here. & supplies for the animals. Please tweet @FrancescoZacca to thank him. Thanks as always for your support! Mayor Zaccaria is ignoring our petition!! Join our twitter storm to get his attention. 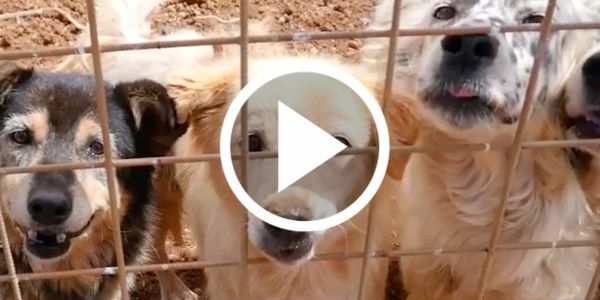 Tweet @FrancescoZacca to demand he follow through on his pledge to save these dogs. We will win a better life for these dogs!